This week the VIX index closed higher than 20 for the first time since June right before Brexit. The S&P 500 fell nine consecutive days in a row through last Friday, the first time that’s happened since gold and silver broke records in the late seventies and early eighties. Monday and Tuesday saw generally positive momentum into the markets. Bitcoin, too, has increased in price, much like it did ahead of Brexit. Over the most recent nine sessions, VIX has increased each time. Early in the day, VIX continued its rise on Tuesday up 6%, but it fell throughout the afternoon leading many analysts to suggest a Ms. Clinton presidential victory. As Wall Street Journal suggests, a Clinton victory could mean a long way to fall for the VIX index. The VIX would seem to be suggesting that there will be no Donald Trump presidency, but, rather, Democratic Presidential candidate Hillary Clinton will be named the president-elect after a long and tough journey to the Presidency which saw the Democratic National Convention come under national scrutiny and Ms. Clinton’s use of internet servers drawing much scrutiny by U.S. law enforcement. By noon Pacific Standard Time, the VIX had dropped more than 4% to 17.92. It dropped massively yesterday, ending the abovementioned nine day rally. 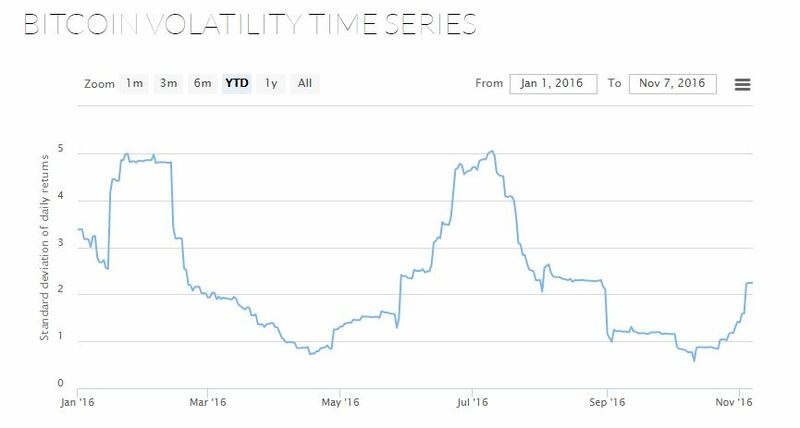 A Bitcoin volatility index, which most recently detected increased BTC volatility in July, in the wake of Brexit, has seen a steady climb in recent days, but the index is still far off its year-to-date highs. In a dizzying array of namedropping and shoutouts, The Game presents the Internet with #hashtaggers’ dream on new track. Sorry Anthony Kiedis, but it appears space was not made in a Hollywood basement. Vivian Kubrick,an American born English filmmaker, has spoken out about accusations that her father – Stanley Kubrick – assisted the US government in faking the film landings. Gov. Jerry Brown signed six gun-control bills into California law on Friday. They encompass restrictions on semiautomatic rifles, as well as a requirement that ammunition purchasers go through background checks in order to “enhance public safety” in California. Gun regulation advocates did not get everything they wanted, as the governor vetoed five other measures, like an expansion on the use of restraining orders to confiscate guns from individuals. The Legislature approved on Thursday a dozen gun-control bills introduced in the aftermath of December’s mass shooting in San Bernardino, which left 14 dead. The tragic events in Orlando, having claimed 49 lives, helped push the bills through. “My goal in signing these bills is to enhance public safety by tightening our existing laws in a responsible and focused manner, while protecting the rights of law-abiding gun owners,” Brown stated in a signing message. The bills, including a ban on sales of semiautomatic rifles with “bullet buttons”, which enable the swift taking out of a magazine and the reloading of the gun. Brown is a gun owner. He hunted when he was younger. In 2013, he vetoed numerous gun control bills. He was happy with Friday’s version, citing its better focus. Brown’s office evoked Lt. Gov. Gavin Newsom’s expansive gun control measures which will appear on the November ballot in the state. “The governor took swift action today and voters will have a chance to go even further in November, if they choose, with the lieutenant governor’s initiative,” remarked Evan Westrup, Brown’s spokesman.